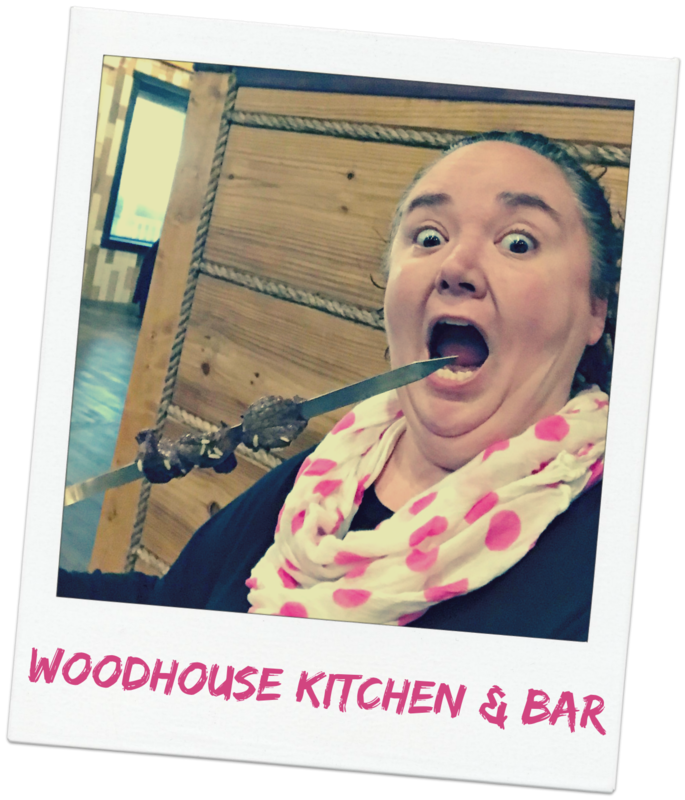 Restaurant Review: Woodhouse Kitchen + Bar, Mason | The Food Hussy! 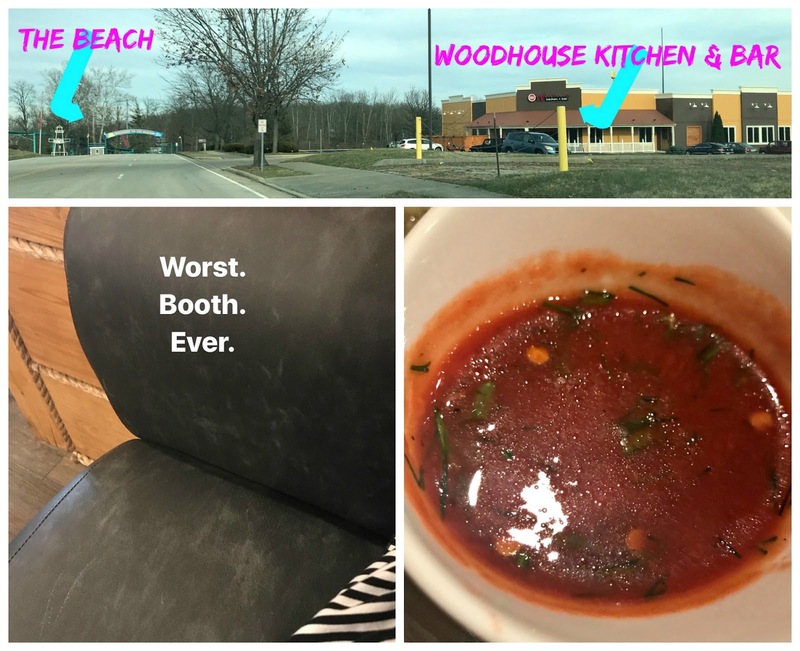 Recently I was invited to try the new Woodhouse Kitchen + Bar in Mason, OH. (They provided our meal free of charge. All opinions are my own.) It's right next to the Beach. A good friend of mine is a chef and I decided to take her with me to the soft opening a few weeks ago. Stemming from their Russian tradition, the owners arrived in Cincinnati by way of Brooklyn from their home of Moscow. Woodhouse was born out of a concept of bringing Euro-style food pairings to Cincinnati’s food culture, offering a unique menu of family-friendly favorites alongside traditional European dishes. It's a former Bob Evans if you couldn't tell. I'm a bit surprised at how little they did to the outside. All in all - this is a really good indication of things to come. It just doesn't make sense. And who would pick that mustard color? We had a free tasting and I was dining with a chef - so we tried a lot of different items. I love Pierogies so I was excited to taste them. They were fine. There wasn't a lot of flavor. Pierogies are dumplings normally filled with meat, mashed potatoes or vegetables. This was missing texture and seasoning. Everything was in desperate need of salt (not on the table). We also tried the Hummus and this was one of the better items of the night. It wasn't really the best hummus ever but for the night - we liked it. The olives were a really nice addition. The pita was also good - very light and fluffy. The portion was huge - we didn't even make a dent in it - they could probably cut back even on that - I felt a little wasteful. Because of the soft opening and we were there on the first night, the chef sent out their Stuffed Dates appetizer. It was awful. First of all - burned. Second - the blue cheese was too much and tasted cheap or bad. Third - It nearly came back for a visit while I was eating it. Just typing these words - remembering that taste - I have a look on my face like I just smelled a bad fart. Oh this was sooooooo bad. And - stuffed dates is a pretty dated appetizer - I remember it being all the rage in NYC when I was there 8 years ago. Under the "Mid" part of the menu, we each tried a salad. Rachel tried this Pear & Fennel salad - which she makes a version of - so it had a lot to live up to. She wasn't impressed. It was fine - but again - in dire need of salt. Also, the vinaigrette was flavorless - you could see it was there but realliy not designate any flavor out of it. Oh here we go again. If you just read the description it sounds very unique and interesting. This was anything but. It was like a shredded slaw and honestly nothing had any FLAVOR. I don't know what it was marinated in but it might have been that same sherry vinaigrette. And the combination of beets and potatoes and peas and red beans - was odd. The latter three all kind of have a mush to them. It wasn't a bad flavor - it just wasn't really much flavor at all. The feta was a mild saving grace but I didn't want to just eat a plate of feta - so I just left most of it after about 3 bites. For the mains, Rachel asked to try two items in a smaller portion and they very kindly obliged. So I don't think this is the full $22 portion size. I'll give ya $5 if you can guess what she said (okay - no I won't - but you can play along) - SEASONING! The rice wasn't saffron - it was just bland. The lamb was cooked well and tasted pretty good - so apparently who ever is on the meat station - has it down. It's also served on a giant sword. Small children at another table ordered this dish...which was SERVED ON A GIANT SWORD. I asked our server (who was wonderful) about this and he said, "Oh their parents are there - it's fine." THEY SERVED CHILDREN MEAT ON A SWORD. This dish was fine - there really wasn't much orange flavor in it - but that was fine. All in all the salmon was cooked well. It was lacking seasoning of course - but all in all - compared to the rest of the meal - this was pretty good. Let me first say - this was by far the best thing I ate all night. It was a decent cut of steak (not Certified Angus) - but it was fine and it had a nice crust and was cooked to a nice medium rare. The issues I have are: 1) You can't tell me a price on the steak? 2) You can't tell me what KIND of steak? 3) Vegetables were near raw. Since the meal was comped - I don't know how much this was - but I think it was upwards of $35. 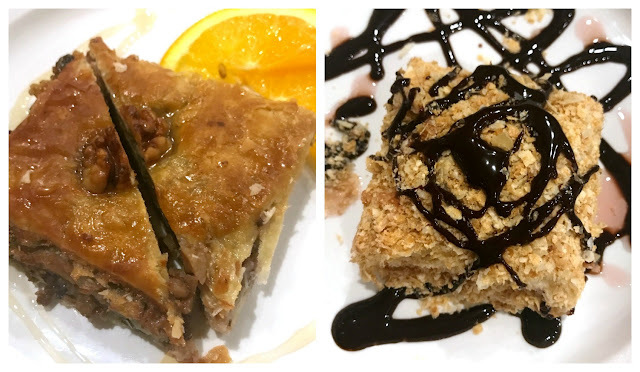 We decided to have dessert as well and they had Baklava and a Napoleon. No idea on the prices since they weren't on the menu. The baklava was fine - not great - we didn't finish it - I have no idea why there was an orange on the plate. The Napoleon was more of the same - it's layers of puff pastry layered with custard. It was not pretty for sure - but it was also super dry - they needed to amp up the custard by 3x. Another blogger visited the next night and agreed the desserts were awful. So - as you could tell - we didn't care for it. But there was more!!! Here's a rundown of some of the other disappointments. - The booths were the single most uncomfortable ever. They had a huge back which led to a super short seat. - The decor was odd. Outside was an ugly Bob Evans, the entry looks like a dungeon, the dining area looks like a ranch. - The music was 80s-90s country - Martina McBride. Dolly Parton. Garth Brooks. - Out back of the restaurant was a GINORMOUS trash pile in the parking lot. I understand it's a soft opening - but come on. - The sauce (shown above) served with the lamb was literally - we both swear on it - cold Hunts Tomato Sauce with something thrown in that added no flavor because it tasted like cold Hunts tomato sauce. How is that a sauce for lamb???? - I ordered a Rose and it was awful. - The lack of seasoning across the board. Everything - minus the steak - was dying for salt and pepper. They don't have salt on the tables - which is fine - but that means they should season appropriately. - Let me share some of the other items on the menu: Borscht, Cabbage Roll, Coq Au Vin, Octopus and Lula. This is an ADVENTUROUS menu - which is fine - good for them for trying. BUT when you have a restaurant 10 STEPS from The Beach Waterpark - what the hell are they thinking? Imagine - you've finished a day at the Beach. You're sweaty, clammy, hot, sun-burned and probably feeling pretty gross. Do you want Borscht? I so wanted to order the Octopus just to see what the hell came out but I know - from experience - I don't like it. I don't do tentacles - it's one of the few things I just can't eat. Why Should You Go? If you want to eat Borscht - go for it. I just think - for the quality of food - it's not worth it in any way, shape or form. There are so many other places in the area that have better food for at least the same prices. There's a major identify crisis going on - and I think it's a terrible location for what they're going for. But - it's one person's opinion. My friend went and they didn't mind it. They didn't love it. There were things that weren't good. But did say the Mussels were great. Wow.... this sounds like a bad experience. So unfortunate that they were nice enough to bring people in and comp the meals, and the result wasn't great. I hope they are able to learn from the issues in their soft opening, and that people aren't too scared away by this really blunt review. Agree completely - it was nice to have them bring us in. It is blunt but I feel like honesty is the best policy. And - at least service was good! Damn, girl, tell us how you really feel, lol! Ha - I tried to put the positives in there too! It was just such a mess! Well,it's not like you got invited to a totally comped meal and then felt compelled to blog about a house that was not actually open for business. And it's super cool that you came back a few times in the following months to give a more accurate review. We that actually do this for a living, that love, bleed and give all that we have to providing the best experience we can to everyone of our guest...we always love opinions from 20 something's based on free food. Thanks so much for voicing your opinion for the world to see and being such a pro...really,a review based on a pre opening menu should absolutely be the new standard, you are blazing a key new trail. 1. Thanks for the compliment - 20-something! Nice! 2. Don't invite bloggers if you don't want to know what we think. Hey "Unknown" - I'm 45. Don't call me kiddo. And maybe spell check before you put "pin too paper". No disrespect intended with the kiddo remark, I assumed you were a youngster, either way, out of line on my end no matter what your age. Also, your opinion on the rose you were subjected to was spot on, no acid, no fruit, ugghh, it was just a blank...it's gone. Forgot to say that you were spot on about that rose...bloody awful.